Vitamin D is essential to so many processes in the body! It isn’t actually a vitamin at all, but a prohormone that is synthesized in the skin using cholesterol in a chemical reaction with UVB radiation from the sun. Genes play a big role in your body’s vitamin D levels. Read on to learn how to check your 23andMe results for your vitamin D genes. Most think of vitamin D in regards to bone health because it regulates the uptake of calcium in our intestines, but it also acts in the nucleus of cells to regulate the production of hundreds of different enzymes, influencing health in a multitude of ways. Vitamin D levels have been associated with a variety of chronic conditions, from mood disorders to cancer risk to immunity to bone density. In general, higher vitamin D levels correspond to a lower risk of getting a variety of chronic diseases. While low levels of vitamin D have been associated with higher risk of a bunch of chronic conditions, supplementing with vitamin D doesn’t always give impressive results in placebo-controlled studies. Do some research before jumping into supplementing with vitamin D. For example, a recent clinical trial found little benefit for postmenopausal women when looking at bone mineral density, but the amount of vitamin D used in the trial may have been too small to get a result. Part of the problem with looking at some of the research studies and clinical trials of vitamin D supplementation is that the doses used may have been too low. A study came out a couple of years ago that claimed there was a statistical error in the calculation for the recommended daily intake of vitamin D. This error changed the supplemental doses needed by a factor of 10; instead of 600IU, some people may need 6000IU+ per day. More recent studies have backed this up, showing also that a person’s weight plays a big role in the amount of vitamin D needed for sufficiency. 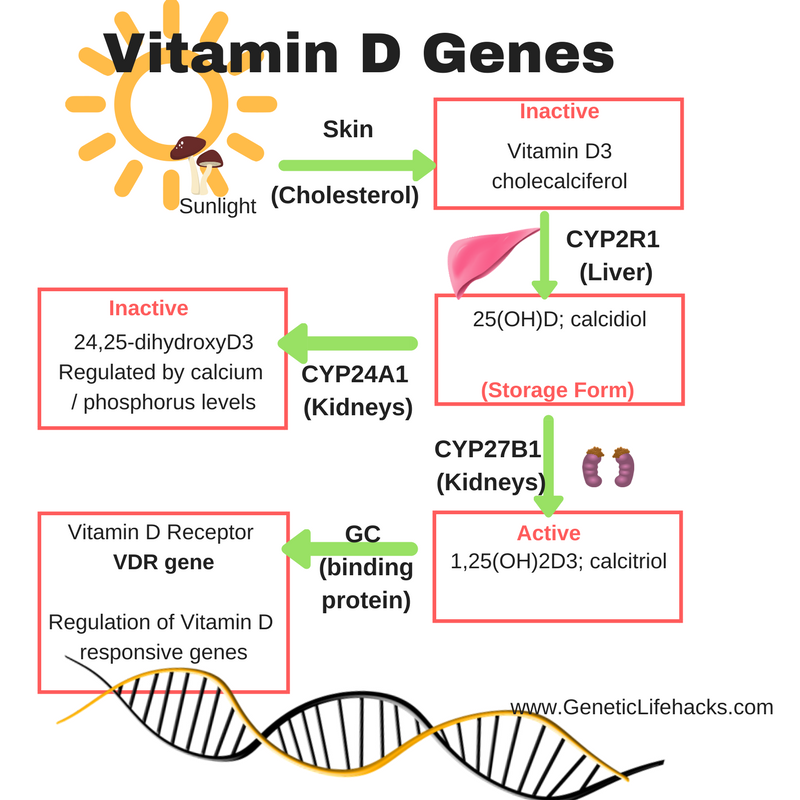 Genes involved in converting vitamin D to the active form. The form of vitamin D produced in our skin is the biologically inactive form, cholecalciferol or Vitamin D3; it is formed through a reaction between UVB rays from sunlight and cholesterol in our skin. Vitamin D3 must then be converted to the active form that our body uses. The first step in the conversion takes place in the liver, where cholecalciferol is hydroxylated in the liver into calcifediol (25(OH)D) using an enzyme that is encoded by the gene CYP27A1. 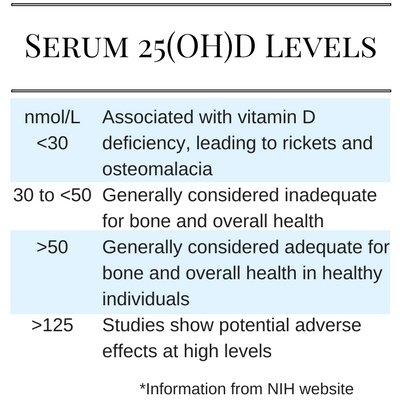 25(OH)D can then be converted in the kidneys or macrophages into calcitriol, the biologically active form of vitamin D also known as 1,25(OH)2D. This conversion takes place using an enzyme coded for by the gene CYP27B1. For Vitamin D to be used in the nucleus of cells, it needs to be transported there by a binding protein that is coded for by the GC gene, and then it needs to bind to the vitamin D receptor, which is coded for by the VDR gene. Genetics can play a role in vitamin D levels in several ways, which makes sense when looking at the different steps involved in converting it to the active form which then acts on the vitamin D receptors in a cell. The vitamin D binding protein is coded for by the GC gene, and polymorphisms in the gene affect the total serum levels of 25(OH)D. Many of the polymorphisms in the GC gene vary in different ethnic groups, and this is thought to be a big part of the difference in vitamin D levels among populations. CYP2R1 is the gene that codes for the enzyme that converts cholecalciferol into calcifediol in the liver. A fairly common genetic variant is associated with decreased vitamin D levels. The second step in the conversion to the active form of vitamin D involves CYP27B1 as a catalyst for the conversion of calcifediol to calcitriol. While there are several common polymorphisms in CYP27B1 that have been studied in regards to vitamin D related conditions, none of them have been definitively shown to have an effect. A couple of rare mutations (listed below) of CYP27B1 do affect the conversion to the active form of vitamin D, and these mutations are linked to rickets, a disease caused by the lack of vitamin D in childhood. Sun exposure seems to be a double-edged sword these days, with UV light giving us vitamin D as well as increasing our risk for cancer. It makes you wonder why all of our ancestors didn’t end up with skin cancer without a handy bottle of sunscreen available. Turns out that our modern lifestyle with light at night (TV’s, tablets, phones, and LED light bulbs) has decreased our melatonin production. Melatonin at the right time plays a big role in both our circadian rhythm and our skins natural ability to withstand UV rays without creating skin cancer. Blocking blue light wavelengths at night increases melatonin production and should increase our skin’s ability to utilize UV rays for vitamin D production without the harmful effects. [study] Read more about melatonin production, genetics, and blue light. In addition to light at night, the time at which you eat also influences the circadian rhythm of your genes. A recent study showed that mice that eat at the wrong time (equivalent to humans eating at night) had increased skin damage from UV light. Basically, eating at the wrong time-shifted the phase of the circadian rhythm of skin genes to where UV damage would be less of a problem at night rather than during the day… and the sun doesn’t shine at night! So an easy ‘lifehack’ here would be to eat dinner earlier in the evening and don’t snack at night. Currently, in the US and Canada, vitamin D is added to milk. Fatty fish, such as salmon, tuna, and mackerel, are also good sources of vitamin D. Some types of mushrooms, when exposed to UV light, also contain vitamin D (as D2). There are many vitamin D supplements available at stores and online. Keep in mind that vitamin D is fat soluble and supplements usually contain oil such as soybean oil, which you may want to avoid. One that I like is this one with coconut oil on Amazon. Again, the jury seems to still be out when it comes to a definitive recommendation on how much vitamin D is needed; you may find that your sun exposure is enough to keep your levels high enough. If you haven’t recently tested your vitamin D level, it is an easy and fairly inexpensive blood test. If you are in the US, there are lots of online sites where you can order lab tests without doctor’s order such as Walk-In labs. You can even order a vitamin D test from Amazon and test your levels at home. I asked on Amazon exactly what is tested. Both storage and active D hormone levels should be tested. Debbie Moon, thanks so much for the post.Really thank you! Great. Debbie Moon,thanks a lot for the article post.Much thanks again. Fantastic. Thank you so much for this! Looks like I’m a low expresser on all three of the GC genes that I can check. Would this indicate that supplementation is a really good idea for me, or does it instead indicate that since the GC gene carrier is low, that supplementation won’t help all that much? The other two genes are fairly OK for me.